Peal couscous is delish, light, and versitile. It’s great on it’s own or mixed with your favorite veggies for an instant side dish. Althought it’s a noodle, it has protein so that makes it healthy- right? I went to the farmers market and bought a ton of mushrooms and kale to cook up throughout the week. In an effort to bring my lunch to work more often, this is a great dish to make on a Sunday and snack on throughout the week. The flavors continue to set in and it adds another demension. Best part, it takes about 20 min to make. Enjoy! Heat a large saute pan over medium heat. Add 2 T olive oil & let it heat up. Slice the mushrooms, dice the onion, minced the garlic and thinly slice the kale. Add the onions to the pan, cook for 5 minutes. Add the garlic, cook for 1 minute or until fragrant. Add the sliced mushrooms, cook for 5 minutes & let the mushrooms sit, don’t stir! Reduce heat to medium-low and add 2 T balsamic vinegar. Stir and saute for another 5 minutes or until the mushrooms have absorbed the balsamic. While the mushrooms are cooking, cook the pearl couscous according to package directions. 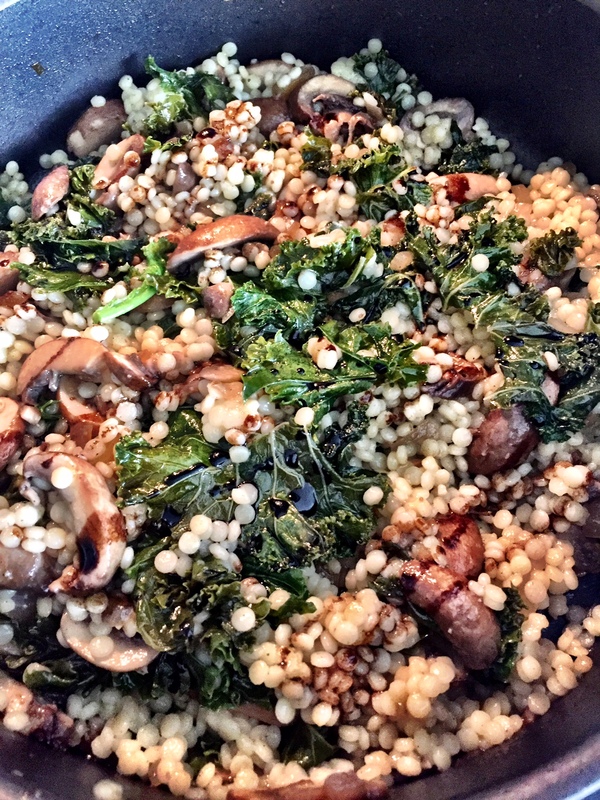 When the couscous is done cooking, add it to the large pan with the mushrooms. Stir to combine. Add 2 T balsamic, pepper and salt to taste. Drizzle balsamic glaze over the top & enjoy!